Located within walking distance of the Glassy Golf Course and Clubhouse, this home is ideal for a Golfer's Retreat, Special Event, or a Family Retreat. This home is conveniently located at the #1 Tee box near the Glassy Clubhouse. Plenty of dining space on the main level. Walking distance to the Clubhouse and Golf Course. **Rent the additional bottom level of this house which has three additional bedrooms, plus a one bedroom apartment area for an additional $200 per night and an additional $150 housekeeping fee in addition to the cost of the 4 bedroom main level of the home! Great for large gatherings. **Call for special arrangements for renting this additional level! Basement Level features Three Guest Rooms and a small Sitting Area with TV, as well as a complete one bedroom apartment. One vehicle pass is provided upon check-in unless additional passes are arranged in advance. There is a maximum of four vehicle passes per reservation unless special arrangements are made for a larger group. 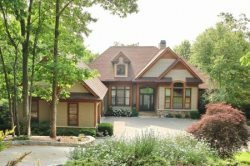 The Cliffs at Glassy offers unequaled luxury living in the Carolinas located on the Cherokee Foothills Scenic Highway, The Cliffs at Glassy extends 3,500 acres at 3,200 feet above sea level on Glassy Mountain, one of South Carolina's natural landmarks.